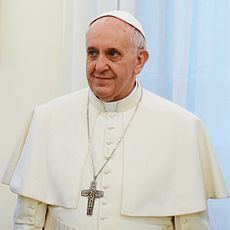 Pope Francis (Jorge Mario Bergoglio) was elected Pope of the Catholic Church in 2013, he took the name Francis after Saint Francis of Assisi, who was known for his embrace of poverty and chastity. Since his election, Pope Francis has stamped his own authority on the Church. In particular, he has sought to emphasize the traditional principles in the gospels of humility, charity and modesty. He has sought to encourage the church to place more emphasis on personal religious practise and concern for the poor, rather than issues related to abortion, contraception and homosexuality. He has personally rejected the more luxurious apartments in the Vatican, preferring to choose simple garments and live in more simple accommodation. Jorge Mario Bergoglio was born in Flores, a suburb of Buenos Aires, on 17 December 1936. He attended a technical secondary school, graduating with a diploma in chemistry. He worked as a chemist in a food laboratory for a few years. In 1955 (aged 19), he began studying at a local seminary in Buenos Aires. On March 11, 1957, he entered the Society of Jesus (Jesuits) as a novice. He went to Santiago, Chile where he studied humanities. On March 12, 1960, he took his initial vows and officially became a Jesuit. During the 1960s, he worked as a teacher, teaching literature and psychology in Sante Fe, and Buenos Aires, Argentina. On 13 December 1969, after finishing his theological studies, he was ordained to the priesthood and became a professor of theology at the seminary of San Miguel. Bergoglio took his perpetual vows in 1973 and was appointed Provincial Superior of the Society of Jesus in Argentina from 1973 to 1979. In 1992, he became Auxilliary Bishop of Buenos Aires, and in 1998 he became the Archbishop. As Archbishop he doubled the number of priests working in the slums of Buenos Aires. He was created cardinal by Pope John Paul II in 2001. He held the position of Archbishop of Buenos Aires until 2011, when he resigned because at the age of 75 it was necessary under church law. After the death of Pope John Paul II, Bergoglio was said to be a realistic candidate to become the new pope. But, instead, Cardinal Ratzinger was chosen. However, in 2013, Pope Benedict XVI announced his retirement. Bergoglio was elected on the Second day of the Papal conclave on 13 March. Explaining his choice of name, Pope Francis said of his patron saint: “The man who gives us this spirit of peace, the poor man,… How I would like a poor Church, and for the poor”. Pope Francis developed a reputation for humility and simplicity. He has often chosen to live in simpler accommodation and rejected the more palatial bishop’s residences. When elected Pope, he preferred to stay in his current accommodation and didn’t move into the Vatican suites. As Archbishop, he took public transport and engaged in the Holy Thursday ritual of washing the feet of the poor, whether in jail or hospital. He has expressed a strong commitment to social justice, arguing that the gospels express an important commitment to reaching out to the disadvantaged of society and working to improve conditions of the poor. Doctrinally, he is considered a conservative. As archbishop, he instigated pro-life work to prevent abortion. In 2007, he criticised the Argentinian government when it intervened to allow an abortion for a mentally handicapped woman who had been raped. But, on coming to be Pope, he has spoken about the need for the Chuch to move on from its obsession with issues of sexuality. Pope Francis has said that social work and religious devotion is much more important, and if the church gets entangled with issues of sexuality, it could fall away. Pope Francis sees improving dialogue between different faiths and religions as an important work of the Catholic church. He has stated that his title ‘Pontiff’ means ‘builder of bridges’ and he has sought to reach out to both non-believers and other religious leaders. People have commented he is sincere and has a strong capacity to create meaningful dialogue, especially with the Eastern Orthodox churches. After his election, leaders of the Islamic community in Buenos Aires welcomed the news saying he “always showed himself as a friend of the Islamic community”, and a person whose position is “pro-dialogue”. As Pope, he has raised the issue of corruption within the church and has warned that as Pope he will not tolerate ongoing corruption and that the punishment for corrupt people should be as, it mentions in the Bible, being tied to a rock and thrown into the sea. He has announced changes to the Vatican bank to make it more transparent. Some argue that the Mafia use the bank for money laundering and are concerned by the Pope’s investigation. On social issues, he has indicated a more liberal attitude to homosexuals. In an informal press conference, he said that he personally does not judge people because of their sexuality. Though church teachings on homosexuality remain. 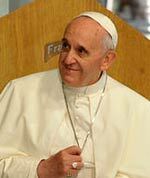 Pope Francis has frequently reiterated the importance for Catholics to wholeheartedly embrace and profess in Jesus Christ as their salvation. He has said that prayer should not be reduced to a weekly 20 minutes, but should become part of life. He has stressed the importance of rejecting worldliness and putting spiritual principles first. He has criticised unbridled capitalism and argues that the ‘cult of money’ is making people miserable. He has criticised the growing inequality within many societies. Pope Francis is the first pope from the Americas and the first Jesuit Pope. Like Pope John Paul II, he is said to have a strong devotion to the Virgin Mary. He is also fond of St Therese of Lisieux and often includes a picture of her in his letter.